Welcome to the Grindstone 4 manual. It was last updated on September 18th, 2017. Grindstone is designed to track time spent working on specific jobs, tasks, goals, etc. Each of these is represented by a work item. Work items have names and notes, both of which are optional. Grindstone also keeps a record of who is logging time, which it represents as a person (plural: people). People have names, which are optional except when using Grindstone Sync. Grindstone allows the creation of additional, user-defined fields for work items, called properties. There are two types of properties: free form and list. Free form properties allow any text, apart from line breaks and carriage returns. List properties require that a list of valid values for the property are maintained by the user in the form of list values. This is useful for avoiding human error when dealing with a property the domain of which truly is limited to a finite list (e.g. clients, projects, priority levels, etc.). Each period of time logged against a work item is called a time slice. Each time slice is associated with one work item and one person. Time slices have a start time, and end time, and notes fields. The notes field is optional, the others are not. Grindstone stores each unique person's due date, estimate, or complete date per work item using assignments. Each assignment is associated with one work item and one person, and there can only be one assignment per each unique combination of work item and person. Each field of an assignment is optional. Assignments are also used to manage permissions in certain configurations of Grindstone Sync. Views are Grindstone's most basic way of displaying information and allowing users to interact with data. There is a type of view for each type of data as shown by the chart above (see Basics), with the exception of free form values. For functionality common to all views, see Views. In order to track time, Grindstone needs to know a thing or two about what is being worked on. That's where the project management features come in to play. This section is all about the tools that are available to define that work and categorize it. Important Deleting work items will also delete all assignments and time slices associated to them. When modifying more than one work item, Grindstone will at first show only the values all work items being modified have in common. If the work items have different values for a particular field, a Multiple Values - Click to Set button will appear over the value of the field. Click that button to instruct Grindstone to set the value of that field for each work item being modified to a value. When using Grindstone Sync and creating a new work item, an additional Create Assignments for People section will be displayed. This allows the user to select one or many people for which to create assignments to the new work item. Click the OK button or press the enter key to create or modify the work item(s). Click the Cancel button or press the escape key to cancel creating or modifying the work item(s). Note The enter key short-cut will not work when the Notes field has focus, so that line breaks may be entered. To confirm creating or modifying the work item using only the keyboard from within this field, hold down the control key and press the enter key. Values left blank will be cleared for the assignments being created or modified. To do this deliberately, delete the text for Due Date or Complete Date using the backspace or delete key, or set an Estimate equal to 0:00:00. When creating new assignments, a list of people and a list of work items will also be displayed. Use the control and shift keys to select more than one entry in each list. Grindstone will create a new assignment for each unique combination of person and work item, or modify an existing assignment if one already exists per a given unique combination. For example, when three work items and two people are selected, up to six new assignments may be created. Click the OK button or press the enter key to create or modify the assignment(s). Click the Cancel button or press the escape key to cancel creating or modifying the assignment(s). These functions are available from assignment and work item views. When used from a work item view, they apply specifically to the current person's assignment per the work item operated upon. The type of property (list or free form) can only be chosen as the property is being created. To enter a list of possible values and constrain the property to only being blank or one of those values, tick the Specify a List of Possible Values for This Property box. Click the OK button or press the enter key to create or modify the property. Click the Cancel button or press the escape key to cancel creating or modifying the property. Note The enter key short-cut will not work when the Notes field has focus, so that line breaks may be entered. To confirm creating or modifying the property using only the keyboard from within this field, hold down the control key and press the enter key. To enter new list values from a list value view quickly, click the Quick Entry button (the icon is a plus sign with a lightning bolt), type the name of a desired list value for the new list property, and then press the enter key. Repeat as necessary to populate the list. The property can only be chosen as the list value is being created. Click the OK button or press the enter key to create or modify the list value. Click the Cancel button or press the escape key to cancel creating or modifying the list value. Important Using the Toggle Listing function causes Grindstone to create a new property and delete an old property that are semantically similar. Views will adjust by eliminating any sub filters that referred to the old property and ignore the creation of the new property. This circumstance can cause the actual behavior of a view to cease conforming to the meaning of the view as understood by users. The whole point of Grindstone's time tracking is to offload to an app all the labor of keeping meticulous notes on when work starts and stops, without sacrificing accuracy or precision. A user needs only to quickly update Grindstone on their work status when it changes, and Grindstone manages the log by creating time slices as appropriate. Grindstone features the Stopwatch, which is responsible for giving users a summary of exactly what Grindstone thinks is going on, and quick ways to make changes. To make interactions with the Stopwatch as unobtrusive as possible, Grindstone also features Stopwatch mode. In this mode, the entire Grindstone interface is tucked away except for the Stopwatch, and the Stopwatch floats above other apps so users can always see it and potentially interact with it. Users can work and track their time accurately without ever having to use the full Grindstone interface. There are several preferences governing the behavior of the Stopwatch and Stopwatch mode. For more information, please see Options. If a work item is being timed when Grindstone senses the user has left, it will stop timing. When the user returns, Grindstone will ask the user what happened for the interim during which they were gone. Once the user answers Grindstone, it will make the appropriate adjustments to their timing data. There are several preferences governing the behavior of away detection. For more information, please see Options. When modifying a time slice, the person field will be disabled, since time cannot be reassigned between people. The window that is shown when modifying a timeframe is the Timeframe Editor. 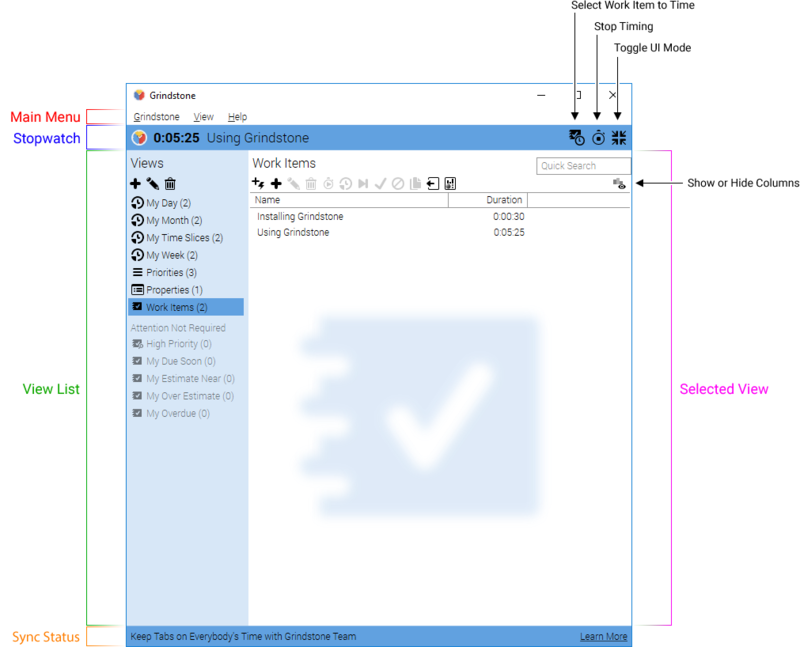 Modifying timeframes occurs when the user splits a time slice, edits a gap in the gap detector, or responds to the return from away notification by telling Grindstone that their time away has complications. Use the controls for each time slice to make adjustments as necessary. Grindstone will automatically clip and remove time slices to prevent overlap as adjustments are made. Click the OK button or press the enter key to log the time as represented by the time slices on the right side of the window. Click the Cancel button or press the escape key to discard any changes to the timeframe. Click the Grindstone logo in the Stopwatch, select Move Timed Slice, and then complete steps 4 and 5 above. If the currently timed slice needs to be split, one can also click the Grindstone logo in the Stopwatch, select Split Timed Slice, and then complete steps 4 and 5 above. Click the Close button or close the Gap Detector window when satisfied. Important The Merge function will not rearrange time slices in any way. It will only merge them, and only if they are for the same work item and person, and are adjoining or overlapping. If there is even one second between two otherwise adjoining time slices, they will not be merged. Use the Gap Detector to resolve these gaps quickly and use Merge again. Views are Grindstone's most basic way of displaying information and allowing users to interact with data. There is a type of view for each type of data as shown by the chart in the Basics section (with the exception of free form values). This section deals with functionality common to all types of views. Then, select the menu option that corresponds to the type of view desired. The window that is shown when creating or modifying views is the View Editor. It allows the user to specify the name of the view using the Name field. Views feature two ways to refine the list of entries they display out of all the entries possible: Quick Search (see Quick Search) and Filters (see Filters). Both of these features can be active at once. If the Notify me when something is added to this view box is checked, Grindstone will do exactly that. This can occur because views continuously monitor all potential entries in order to add them to the view when they are changed to fall within the parameters of Quick Search and/or Filters, and vice-versa: to remove present entries when they are changed to cease falling within the parameters. This option exists because the view is unlikely to have the user's undivided attention when entries are added, which might be important to the user. Click the OK button or press the enter key to create or modify the view(s). Click the Cancel button or press the escape key to cancel creating or modifying the view(s). Views feature many more columns than they show by default when they are created. They can be rearranged by clicking and dragging on their headers. They can sorted by clicking their headers. They can be toggled on or off with the menu shown when clicking on the Show or Hide Columns button (the icon is bars with an eye) above the list of entries, on the right. In addition to the aspects of view entries listed below, properties are also available. Quick Search applies a simple text search to all characteristics of a candidate entry, displaying it only if at least one characteristic contains the text entered by the user. While a quick search is active, the Quick Search textbox will have a pulsing background and display an “X” button. Click the "X" button to cancel the quick search. A filter applies a user-defined test to a single characteristic of a candidate entry. Entries are displayed only if all filters are satisfied (or if there are no filters). Filters may be managed from the View Editor. To add a new filter, click the Add Filter button (the icon is a funnel). To toggle negation of a filter, click the Negate Filter button (the icon is the outline of a funnel). To toggle case-insensitivity for a filter, click the Case Insensitive Filter (this icon is a funnel with A's). To delete a filter, click the Delete Filter button (the icon is a funnel with an “X”). The characteristic is the first drop-down box. The test is the second drop-down box. For most tests, the value is the third element in the filter's interface. For filters testing with Is Element In, the list of elements appears below the characteristic and test. To add a new element, enter or select it using the area just below the list of values and then click the Add Element button (the icon is a funnel with three dots). To delete an element, select it in the list of elements and then click the Delete Selected Elements button (the icon is a funnel with three dots and an “X”). For filters testing with Apply Subfilters, the list of subfilters appears, indented, below the characteristic and test of the parent filter. To add a new subfilter, click the Add Subfilter button (the icon is two funnels with a plus sign). Subfilters are just like filters, except using property values instead of built in characteristics. Thus, the first drop-down will be the list of properties available. When using the Property Values characteristic in the parent filter, all properties will be available. When using the Property Values (Select) characteristic in the parent filter, only list properties will be available. However, when attempting to use Quick Entry in one of these conditions, an option to alter the condition so that Quick Entry can work will be offered. The most direct method of extracting data from Grindstone is to export a view. When a view is exported, Grindstone will use the currently displayed columns, sorting, quick search, and filtering. Graph can also be accessed directly from the view list by right-clicking on a view and selecting Graph. Grindstone Sync is a service that allows teams of Grindstone users to track their time together. Once a database is paired with Grindstone Sync, the personal password will no longer be required. To see a list of the databases paired with Grindstone Sync (and perhaps revoke their access), see Managing Paired Clients. To ensure that a password is required anyway each time that particular database is opened, use the Encryption feature. When Grindstone is unable to connect to Grindstone Sync, it will still open and allow normal usage. During this time, it will attempt to reconnect to Grindstone Sync. Once it reconnects successfully, all changes made by the user while offline will be attempted. Any that fail due to conflicts will be reversed. Normal users of Grindstone Sync can only see their own assignments and time slices. Administrative users can see all assignments and time slices. In between these two roles, Grindstone Sync allows for supervisors. Supervisors can perform administrative actions (see and manage the assignments and time slices of other people), but only for specific people as specified by an administrator. Supervision can also be implicit: supervisors can perform administrative actions for people supervised by those they supervise, with as many levels of supervision as may be desired. For more information on setting up supervisors, see Person Security. All of the features listed in this section are only available to administrators. To create a Grindstone Sync Cloud Subscription, click here. To purchase a Grindstone Sync Server, click here. Click the OK button or press the enter key to create or modify the person. Click the Cancel button or press the escape key to cancel creating or modifying the person. Important Newly created people cannot connect to Grindstone Sync until their login and password have been set by editing their security settings. If a new person is being integrated into the team, double-check the name that was retrieved from the database to ensure it is correct, modifying as necessary. If using one's own independent database is being used to initialize the team, check the I am integrating my own data from a previous database box. Grindstone will attempt to re-use existing team properties and work items rather than create new ones for data from the database. Review the Match Properties and Match Work Items entries. If an existing entry has already been matched, but is incorrect, click Clear. If an existing entry has not been matched, but an appropriate one does exist, click Select and select the appropriate entry. Once satisfied, click the OK button. Grindstone Sync offers a complete Graph API for third party apps and services to interact with Grindstone Sync data. The documentation for this feature is available here. However, access must be granted to third-party services to access the Grindstone Sync data via API keys. Each API key has an associated name, for the benefit of human beings that need to know which keys are being used by which third-party apps and services. The key itself is randomly generated and cannot be altered. Encrypted databases are saved in a manner that prevents anyone without the encryption password to open the database. Even Epiforge Support cannot “get around” this encryption, so be careful with encryption passwords. Welcome back! A number of things have changed in Grindstone. But don't worry, we'll get you up to speed in no time. Grindstone Sync does not have its own interface. Whereas Task Force required you to open a web app in your browser to do things like manage users, run team reports, and assign work; all of this is now done entirely within the Grindstone 4 interface. Grindstone 4 automatically submits all information to Grindstone Sync in real time. Your team members no longer need to regularly submit their changes. You can even observe them tracking time as they do it. Some of the common kinds of data in Grindstone have new names. There is a type of view for each type of data. For more details, see Views. You may have noticed in the screenshot above that the Stopwatch is now a part of the main Grindstone window. Please also take note of the Toggle UI Mode button, which causes the Grindstone window to hide everything but the Stopwatch, giving you the familiar Stopwatch interactions to which you're accustomed. Grindstone will also automatically enter Stopwatch mode if it loses focus for 15 seconds, by default. Grindstone 4 supports free form properties (formerly called custom fields) just like previous versions of Grindstone. However, we have also introduced list properties, which allow you to specify a list of values that the property can have. So, if you have a property to denote the client or the project, you can now manually manage the list clients or projects, respectively. If you're using a database which you've converted from Grindstone 2 or Grindstone 3, or migrated a Task Force subscription, then your custom fields became free form properties to match the behavior of the previous version. To change them to list properties, use the Toggle Listing function. For more detailed information, see Properties. All reporting features from previous versions have been replaced by Graph or Exporting Views in Grindstone 4. Selecting one of these familiar presets will configure Graph to represent data as the former reports did. There is not an exact equivalent to the Summary report in previous versions. However, you can export the contents of any view, which is what Summary was for. To export the contents of a view, click the Export… button (second-to-last, beneath the view's name). Note Export uses the columns of the view as toggled on and arranged. Re-arrange them by dragging and dropping them into position. Toggle them on or off by clicking the Show or Hide Columns button, found beneath Quick Search. Note Export obeys the filters and quick search of the view. Use these tools as necessary to refine the scope of your export. The desktop edition of Grindstone (as opposed to the edition available in the Windows Store) periodically checks for new versions made available by Epiforge. When a new version is available, Grindstone will download it automatically and ask to install it. If the notification is ignored or dismissed, Grindstone will perform the update the next time it starts.